Alright, it’s time for a Pop Quiz. Please get out your #2 pencils. Are you ready? Don’t worry, I won’t grade it. When you hear the words report card, what do you think of? Depending on the age of your child, some of these answers may be more applicable than others. Suffice it to say that each of the above words are often synonymous with report card. Although I knew it was normal to compare, it wasn’t actually the comparisons that made me cringe as a teacher. You see, there was a section of the report card, usually tucked away in the corner of the page, which contained a tremendous amount of meaning. It was a section that in my eyes was a better indicator of life success than the actual letter grades. Unfortunately, none of the students ever talked about it because they were conditioned to believe that a report card is all about a grade or percentage. The section I’m referring to is what I call the Character Report. While the letter grades serve as a gauge for what a student was able to accomplish academically, the character report is a gauge for who they were in the classroom. This past week, my oldest daughter brought home her first report card of the year for second grade. The first thing I did was to direct her attention to the Character Report. Before we even looked at her academic development (grades), I celebrated her character accomplishments. I wanted her to understand that school isn’t just about what she’s able to accomplish in reading, writing, and math. Equally important to her academics is who she is for her classmates. This is precisely what I would do as a teacher during parent/teacher conferences. Parents would often arrive with a series of questions, most of which were academic related, but it was the Character Report where we’d spend the first ten minutes of the conference. Not surprisingly, many of the academic questions were answered as we talked about specific character traits (i.e. responsibility). It’s not your grades that influence your character; it’s the other way around. While a letter grade is an end product, one’s character is more of a process. Unfortunately, in the world of education, we continue to place an emphasis on the product, not the process. If you’re a parent, I encourage you to spend some time talking about this section of the report card with your child. Explain to them that their success in life is not predicated on what they accomplish on a test, but rather who they are as a person. 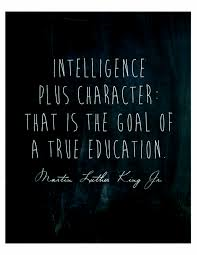 While content can be taught, character must be nurtured. Both are critical to success.